Nate Baker, 2013 MVS scholar sponsored by Tyrone, Pa., Lodge No. 212, is the freshman representative on the Elks Scholar Advisory Board and new to college life. Throughout his first year of college, we’ll be following Nate through monthly blog posts. Check back each month to see what new adventures Nate encounters during this first year at Cornell! While just about everyone else fled campus this October to head home, I headed up to the “True North Strong and Free.” That’s right, O Canada! Montreal, to be exact. Equipped with my weak understanding of the French language, passport and bookbag, I boarded the bus for a seven hour international journey out of the infamous “Cornell bubble” and into the real world. The Big Red Marching Band was going to Canada! After crossing the border, several sessions of mad-libs, watching the worst movie that anyone can find (Sharknado anyone? ), and cramming 10 people into the bus bathroom (claustrophobia...), among other odd traditions, we entered a land where the speed limit signs were in kilometers and the exit signs in French. 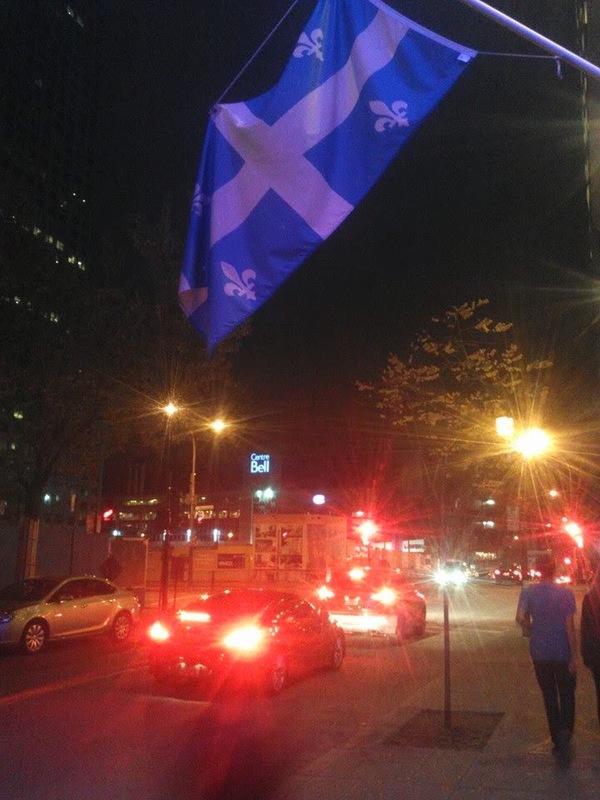 Montreal is a beautiful place. With culture and pedestrian spaces everywhere, it is reminiscent of the streets of a European city, conveniently located just a car ride north. We reveled in the night life, ate the classic poutine, and ended the night appreciating the skyline on the hotel balcony. The next morning was damp and foggy. A translucent cover partially obstructed the backdrop of Montreal’s skyscrapers. 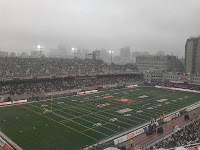 At Percival Molson Memorial Stadium, the band readied to rock pre-game and halftime as the Montreal Alouettes prepared to take on the Winnipeg Blue Bombers. This is Canada's version of the annual Dallas Cowboys’ Thanksgiving game. 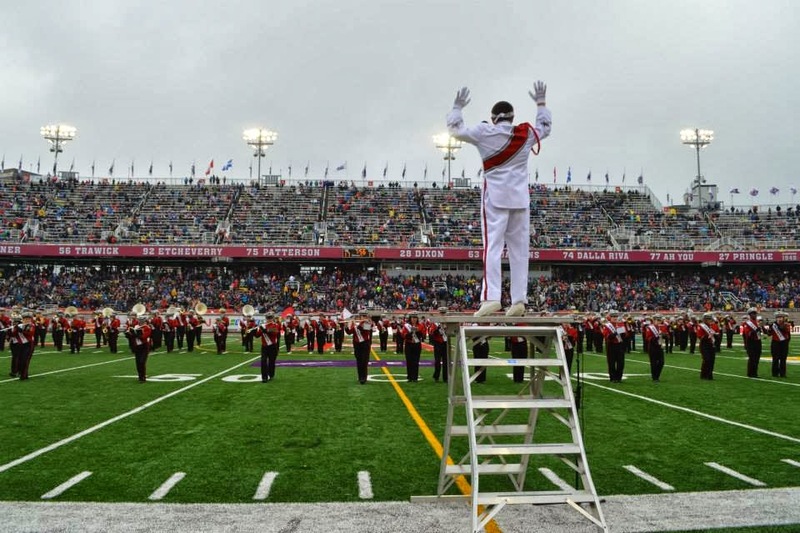 We paraded around, played a concert for generally receptive Québécois people, and finally stepped onto the field to perform for 25,000 eager Alouettes fans. The performance went over well and the players took the field. We took our seats in the stands and listened to the deep baritone of the Canadian national anthem before kick-off. 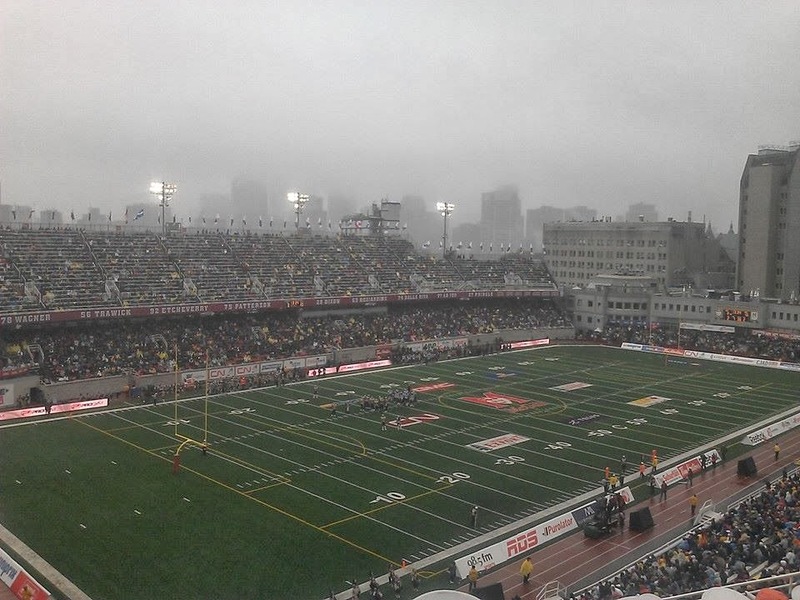 With three downs instead of four, a 55 yard line, 20 yard end zones, and 12 men on the field, the Canadian Football League is a bit different from our tried and true NFL. Nevertheless, we enjoyed the game and even picked up a competitive “faux-fandom” to encourage “My Al’s” against a friend’s “Bombers.” Halftime neared with the score tied. As we were awaiting to take the field and perform a “Les Mis” themed show (how fitting, oui? ), someone asked me, “Hey Nate, what are you thankful for?” This question caught me off-guard. Being that it was Canadian Thanksgiving and I was in Canada, I should probably take time to reflect. I am thankful for a lot of things, namely my family, friends, health, and most definitely being an Elks scholar!! I halfheartedly blurted out something about the fact that it stopped raining. In all seriousness, now that I have had time to rethink my answer, I would answer it in the following way: I am thankful for opportunity. The opportunity to be in such a great place surrounded by greater people seems unreal to me. The opportunity to be the first one in my family to go to college and having the support of my family and friends is what got me here. The opportunities that have arisen in my life over the last year are incredible and I can’t be thankful enough. I challenge readers to decide what they are thankful for and share it here or, preferably, with the people for whom you are thankful.